The problem of discovering spatiotemporal sequential patterns affects a broad range of applications. Many initiatives find sequences constrained by space and time. 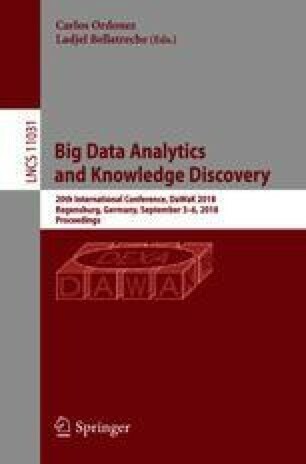 This paper addresses an appealing new challenge for this domain: find tight space-time sequences, i.e., find within the same process: (i) frequent sequences constrained in space and time that may not be frequent in the entire dataset and (ii) the time interval and space range where these sequences are frequent. The discovery of such patterns along with their constraints may lead to extract valuable knowledge that can remain hidden using traditional methods since their support is extremely low over the entire dataset. We introduce a new Spatio-Temporal Sequence Miner (STSM) algorithm to discover tight space-time sequences. We evaluate STSM using a proof of concept use case. When compared with general spatial-time sequence mining algorithms (GSTSM), STSM allows for new insights by detecting maximal space-time areas where each pattern is frequent. To the best of our knowledge, this is the first solution to tackle the problem of identifying tight space-time sequences. This work was partially funded by CAPES, CNPq, FAPERJ, Inria SciDISC, and the European Union’s Horizon 2020 - The EU Framework Programme for Research and Innovation 2014–2020, under grant agreement No. 732051.